This paper presents a novel development of a fuzzy logic controlled power system using UPFCs to damp the oscillations in a FACTS based integrated multi-machine power system consisting of 3 generators, 3 transformers, 9 buses, 4 loads & 2 UPFCs. Oscillations in power systems have to be taken a serious note of when the fault takes place in any part of the system, else this might lead to the instability mode & shutting down of the power system. UPFC based POD controllers can be used to suppress the oscillations upon the occurrence of a fault at the generator side or near the bus side. In order to improve the dynamic performance of the multi-machine power system, the behavior of the UPFC based POD controller should be coordinated, otherwise the power system performance might be deteriorated. In order to keep the advantages of the existing POD controller and to improve the UPFC-POD performance, a hybrid fuzzy coordination based controller can be used ahead of a UPFC based POD controller to increase the system dynamical performance & to coordinate the UPFC-POD combination. This paper depicts about this hybrid combination of a fuzzy with a UPFC & POD control strategy to damp the electro-mechanical oscillations. The amplification part of the conventional controller is modified by the fuzzy coordination controller. Simulink models are developed with & without the hybrid controller. The 3 phase to ground symmetrical fault is made to occur near the first generator for 200 ms. Simulations are performed with & without the controller. The digital simulation results show the effectiveness of the method presented in this paper. AFACTS based multi-machine power system comprising of 3 generators, 9 buses, 3 loads with and without the 2 Fuzzy-POD-UPFC controllers was considered in this paper. SIMULINK models were developed in MATLAB 7 with & without the Fuzzy- POD-UPFC controllers for the considered multi machine model in order to damp out the oscillations. The control strategy was also developed by writing a set of fuzzy rules. The fuzzy control strategy was designed based on the conventional POD-UPFC controller & put before the POD-UPFC in the modeling. The main advantage of putting the fuzzy coordination controller before the POD-UPFC in modeling is the amplification part of the conventional controller being modified by the fuzzy coordination unit, thus increasing the power system stability. Simulations were run in Matlab 7 & the results were observed on the scope. Graphs of power angle vs. time were observed with and without the controller. From the simulation results, it was observed that without the Fuzzy-POD-UPFC controller, the nine bus system will be having more disturbances, while we check the power angle on the first generator. 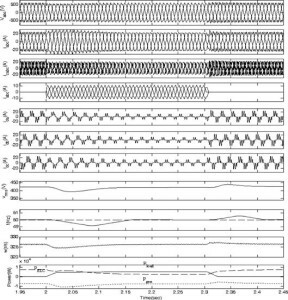 There are lot of ringing oscillations (overshoots / undershoots) & the output takes a lot of time to stabilize, which can be observed from the simulation results. But, from the incorporation of the Fuzzy- POD-UPFC coordination system in loop with the plant gave better results there by reducing the disturbances in the power angle and also the post fault settling time also got reduced a lot. The system stabilizes quickly, thus damping the local mode oscillations and reducing the settling time immediately after the occurrence of the fault. The developed control strategy is not only simple, reliable, and may be easy to implement in real time applications. The performance of the developed method in this paper thus demonstrates the damping of the power system oscillations using the effectiveness of Fuzzy-POD-UPFC coordination concepts over the damping of power system oscillations without the Fuzzy-POD-UPFC coordination scheme.
. L. Gyugi, “Unified Power flow concept for flexible AC transmission systems”, IEE Proc., Vol. 139, No. 4, pp. 323–332, 1992.
. M. Noroozian, L. Angquist, M. Ghandari, and G. Anderson, “Use of UPFC for optimal power flow control”, IEEE Trans. on Power Systems, Vol. 12, No. 4, pp. 1629–1634, 1997.
. Nabavi-Niaki and M.R. Iravani, “Steady-state and dynamic models of unified power flow controller (UPFC) for power system studies”, IEEE’96 Winter Meeting, Paper 96, 1996.
. C.D. Schauder, D.M. Hamai, and A. Edris. “Operation of the Unified Power Flow Controller (UPFC) under Practical constraints”, IEEE Trans. On Power Delivery, Vol. 13, No. 2. pp. 630~639, Apr. 1998. Because of the low maintenance and robustness induction motors have many applications in the industries. Most of these applications need fast and smart speed control system. This paper introduces a smart speed control system for induction motor using fuzzy logic controller. Induction motor is modeled in synchronous reference frame in terms of dq form. The speed control of induction motor is the main issue achieves maximum torque and efficiency. Two speed control techniques, Scalar Control and Indirect Field Oriented Control are used to compare the performance of the control system with fuzzy logic controller. Indirect field oriented control technique with fuzzy logic controller provides better speed control of induction motor especially with high dynamic disturbances. The model is carried out using Matlab/Simulink computer package. The simulation results show the superiority of the fuzzy logic controller in controlling three-phase induction motor with indirect field oriented control technique. Fig. 2. Indirect Field Oriented Control of IM. Fig 4. Torque response of scalar and vector control. Fig. 5. Flux response of scalar control. Fig. 6. Flux response of vector control. Fuzzy logic controller shows fast control response with three-phase induction motor. Two different control techniques are used with Fuzzy logic controllers which are scalar and field oriented control techniques. Fuzzy logic controller system shows better response with these two techniques. Meanwhile, the scalar controller has a sluggish response than FOC because of the inherent coupling effect in field and torque components. However, the developed fuzzy logic control with FOC shows fast response, smooth performance, and high dynamic response with speed changing and transient conditions. A. Mechernene, M. Zerikat and M. Hachblef, “Fuzzy speed regulation for induction motor associated with field-oriented control”, IJ-STA, volume 2, pp. 804-817, 2008. Leonhard, W.,” Controlled AC drives, a successful transfer from ideas to industrial practice”, CETTI, pp: 1-12, 1995. M. Tacao, “Commandes numérique de machines asynchrones par lagique floue”, thése de PHD, Université de Lava- faculté des science et de génie Québec, 1997. Fitzgerald, A.E. et al., Electric Machinery, 5th Edn, McGraw-Hill, 1990. Marino, R., S. Peresada and P. Valigi, “Adaptive input-output linearizing control of induction motors”, IEEE Trans. Autom. Cont., 1993. This paper deals with the power quality improvement in a conventional electronic load controller (ELC) used for isolated pico-hydropower generation based on an asynchronous generator (AG). The conventional ELC is based on a six-pulse uncontrolled diode bridge rectifier with a chopper and an auxiliary load. It causes harmonic currents injection resulting distortion in the current and terminal voltage of the generator. The proposed ELC employs a 24-pulse rectifier with 14 diodes and a chopper. A polygon wound autotransformer with reduced kilovolts ampere rating for 24-pulse ac–dc converter is designed and developed for harmonic current reduction to meet the power quality requirements as prescribed by IEEE standard-519. The comparative study of two topologies, conventional ELC (six-pulse bridge-rectifier-based ELC) and proposed ELC (24-pulse bridge-rectifier-based ELC) is carried out in MATLAB using SIMULINK and Power System Block set toolboxes. Experimental validation is carried out for both ELCs for regulating the voltage and frequency of an isolated AG driven by uncontrolled pico-hydro turbine. Fig. 1. IAG system configuration and control strategy of a chopper switch in a six-pulse diode bridge ELC. Fig. 2. Simulated transient waveforms of IAG on application and removal of consumer load using six-pulse diode-bridge-rectifier-based ELC. Fig. 3. Simulated transient waveforms on application and removal of consumer load using 24-pulse rectifier-based ELC. Fig. 4. Waveforms and harmonic spectra of (a) conventional six-pulse ELC current (ida ), (b) generator voltage (va), and (c) generator current (ia ) under the zero consumer load conditions. Fig. 5. 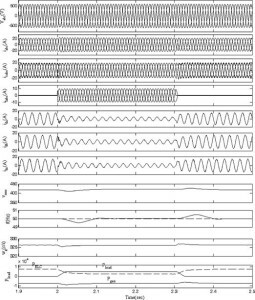 Waveforms and harmonic spectra of (a) proposed 24-pulse ELC current (ida ), (b) generator voltage (va ), and (c) generator current (ia ) under the zero consumer load conditions. The proposed ELC has been realized using 24-pulse converter and a chopper. A comparative study of both types of ELCs (6-pulse and 24-pulse configured ELC) has been demonstrated on the basis of simulation using standard software MATLAB and developing a hardware prototype in the laboratory environment. The proposed 24-pulse ELC has given improved performance of voltage and frequency regulation of IAG with negligible harmonic distortion in the generated voltage and current at varying consumer loads. B. Singh, “Induction generator—A prospective,” Electr. Mach. Power Syst., vol. 23, pp. 163–177, 1995. R. C. Bansal, T. S. Bhatti, and D. P. Kothari, “Bibliography on the application of induction generator in non conventional energy systems,” IEEE Trans. Energy Convers., vol. EC-18, no. 3, pp. 433–439, Sep. 2003. G. K. Singh, “Self-excited induction generator research—A survey,” Electr. Power Syst. Res., vol. 69, no. 2/3, pp. 107–114, May 2004. R. C. Bansal, “Three phase isolated asynchronous generators: An overview,” IEEE Trans. Energy Convers., vol. 20, no. 2, pp. 292–299, Jun. 2005. O. Ojo, O. Omozusi, and A. A. Jimoh, “The operation of an inverter assisted single phase induction generator,” IEEE Trans. Ind. Electron., vol. 47, no. 3, pp. 632–640, Jun. 2000. This paper presents a control strategy for a Unified Power Quality Conditioner. This control strategy is used in three-phase three-wire systems. The UPQC device combines a shunt-active tilter together with a series-active filter in a hack to- back configuration, to simultaneously compensate the supply voltage and the load current. Previous works presented a control strategy for shunt-active filter that guarantees sinusoidal, balanced and minimized source currents even if under unbalanced and / or distorted system voltages, also known as “Sinusoidal Fryze Currents”. Then, this control strategy was extended to develop a dual control strategy for series-active filter. Now, this paper develops the integration principles of shunt current compensation and series voltages compensation, both based on instantaneous active and non-active powers, directly calculated from a-b-c phase voltages and line currents. Simulation results are presented to validate the proposed UPQC control strategy. Fig. 1 . General configuration of the Unified Power Quality Conditioner – UPQC. Fig. 2: Load current. current of the shunt active filter and source current. A control strategy for Unified Power Quality Conditioner – the UPQC – is proposed. Simulation results have validated the proposed control strategy, for the use in three-phase three-wire systems. In case of using in three phase four-wire systems, there is the necessity of compensating the neutral current. In this case, three-phase four wire PWM converter is necessary. The computational efforts to develop the proposed control strategy is reduced, if compared with pq-Theory based controllers, since the α-β-0 transformation is avoided. For three-phase three-wire systems, the performance of the proposed approach is comparable with those based on the pq Theory, without loss of robustness even if operating under distorted and unbalanced system voltage conditions. Presently, the authors are working on the possibility of extending the proposed control strategy for the use in three phase four-wire systems. S. Fryze. “Wirk-. Blind- und Scheinleistung in elektrischen Stromkainsen mit nicht-sinusfomigen Verlauf von Strom und Spannung.” ETZ-Arch. Elektrotech.. vol. 53. 1932, pp. 596-599. 625-627. 700-702. L. Malesani. L. Rosseto. P. Tenti. “Active Filter for Reactive Power and Harmonics Compensation”, IEEE – PESC 1986. pp. 321-330. Luis F.C. Monteiro, M. Aredes. “A Comparative Analysis among Different Control Strategies for Shunt Active Filters.” Proc. (CDROM) of the V INDUSCON – Conferencia de Aplicacoes In dustriais. Salvador. Brazil, July 2002. pp.345-350. T. Furuhashi, S . Okuma. Y. Uchikawa, “A Study on the Theory of Instantaneous Reactive Power,” IEEE Trans. on Industrial Electronics. vol. 37. no. 1. pp. 86-90. Feb. 1990. L. Rossetto, P. Tenti. “Evaluation of Instantaneous Power Terms in Multi-Phase Systems: Techniques and Application to Power- Conditioning Equipments.” ETEP – Eur.. Trans.elect. Po wer Eng . vol. 4. no. 6. pp. 469-475, Nov./Dec. 1994. The objective of this paper is to develop a DC power supply system with photovoltaic (PV) grid-connection and active power filtering. The proposed power supply system consists of an input stage and an output stage. In the input stage, a dc/dc converter incorporated with the perturbation-and-observation method can draw the maximum power from the PV source, which can be delivered to the output stage. On the other hand, grid connection or active power filtering, depending on the power of photovoltaic; will be implemented by a dc/ac inverter in the output stage. Two microcontrollers are adopted in the proposed system, of which one is to implement the MPPT algorithm, the other is used to determine the operation modes, which can be grid connection mode, direct supply mode or active power filtering mode. Finally, the experimental results are measured to verify the proposed algorithms and feasibility of the system. Fig. 3 Experimental results of the MPPT function of the boost converter operate under input voltage change (150V→200V→150V). Fig. 4 The AC voltage Vac and output current io waveforms while output power is (a) 1kW, (b) 500W and (c) 250W. Fig. 5 The load current waveform with Rn=50Ω. Fig. 8 The measured results of AC voltage Vac, AC current is and compensated current ic of the system operate under the active power filtering mode. Fig. 9 The load variations of the proposed power system operates under active power filtering mode (a) heavy load → light load, and (b) light load →heavy load. Fig. 10 The operational mode switching of the proposed r system. A DC power system with PV grid-connection and active power filtering has been presented in this paper, in which a DC/DC converter is firstly used to promote the output voltage of PV array and achieve the MPP. The proposed system can automate switching among the grid connection mode, direct supply mode or active power filtering mode according to the output power of PV array. In addition, two microcontrollers are used to act as system controllers, in which can except implement complicate calculation and PWM output, it can also reduce the hardware complication and cost to improve the reliability and feasibility of system. The experimental results have verified the feasibility and flexibility of the proposed system. A. Lohner, T. Meyer and A. Nagel,“A New Panel- Integratable Inverter Concept for Grid-Connected Photovoltaic System,”IEEE International Symposium on Industrial Electronics, Vol. 2, June 1996, pp. 827-831. U. Herrmann, H. G. Langer, H. van der Broeck,“Low Cost DC to AC Converter for Photovoltaic Power Conversion in Residential Applications,”Proceedings of the IEEE PESC, June 1993, pp. 588-594. J. H. R. Enslin, M. S. Wolf, D. B. Snyman and W. Sweiges,“Integrated Photovoltaic Maximum Power Point Tracking Converter,”IEEE Trans. On Industrial Electronics, Vol. 44, No. 6, 1997, pp. 769-773. S. J. Chiang, K. T. Chang and C. Y. Yen,“Residential Photovoltaic Energy Storage System,” IEEE Trans. on Industrial Electronics, Vol. 45, No. 3, 1998, pp. 385-394. S. Sopitpan, P. Changmoang and S. Panyakeow,“PV Systems With/without Grid Back-up for Housing Applications,”Proceedings of the IEEE Photovoltaic Specialists Conference, 2000, pp. 1687-1690. Modeling and simulation of electromechanical systems with machine drives are essential steps at the design stage of such systems. This paper describes the procedure of deriving a model for the brush less dc motor with 120-degree inverter system and its validation in the MATLAB/Simulink platform. The discussion arrives at a closed-loop speed control, in which PI algorithm is adopted and the position-pulse determination is done through current control for a standard trapezoidal BLDC motors. The simulation results for BLDC motor drive systems confirm the validity of the proposed method. The nonlinear simulation model of the BLDC motors drive system with PI control based on MATLAB/Simulink platform is presented. The control structure has an inner current closed-loop and an outer-speed loop to govern the current. The speed controller regulates the rotor movement by varying the frequency of the pulse based on signal feedback from the Hall sensors. The performance of the developed PI algorithm based speed controller of the drive has revealed that the algorithm devises the behavior of the PMBLDC motor drive system work satisfactorily. Current is regulated within band by the hysteresis current regulator. And also by varying the moment of inertia observe that increase in moment of inertia it increases simulation time to reach the steady state value. Consequently, the developed controller has robust speed characteristics against parameters and inertia variations. Therefore, it can be adapted speed control for high performance BLDC motor. [I] Duane C.Hanselman, “Brushless Permanent-Magnet Motor Design”, McGraw-Hill, Inc., New York, 1994. TJ.E. Miller, ‘Brushless Permanent Magnet and Reluctance Motor Drives.’ Oxford Science Publication, UK, 1989. RKrishnan, Electric Motor Drives: Modeling, Analysis, and Control, Prentice-Hall, Upper Saddle River, NJ, 2001. P Pillay and R Krishnan, “Modeling, simulation, and analysis of permanent Magnet motor drives. Part II: The brushless dc motor drive,” IEEE Transactions on Industry Applications, vol.IA-25, no.2, pp.274-279, Mar./Apr. 1989. RKrishnan and A. J. Beutler, “Performance and design of an axial field permanent magnet synchronous motor servo drive,” Proceedings of IEEE lASAnnual Meeting, pp.634-640,1985. The 48-pulse series connected 3-level Neutral Point Clamped (NPC) converter approach has been used in Unified Power Flow Controller (UPFC) application due to its near sinusoidal voltage quality. This paper investigates the control and operation of series and shunt converters with 48-pulse Voltage Source Converters (VSC) for UPFC application. A novel controller for series converter is designed based on the “angle control” of the 48-pulse voltage source converter. The complete simulation model of shunt and series converters for UPFC application is implemented in Matlab/Simulink. The practical real and reactive power operation boundary of UPFC in a 3-bus power system is specifically investigated. The performance of UPFC connected to the 500-kV grid with the proposed controller is evaluated. The simulation results validate the proposed control scheme under both steady state and dynamic operating conditions. Fig. 3 Measured real and reactive power, DC link voltage and converter angles (Top trace: measured line real power (MW); second top trace: measured line reactive power, (MVar); third top trace: DC bus voltage; fourth top trace: shunt converter angle α ; fifth top trace: series converter angle α ; bottom trace: series converter angle σ ). Fig.5 Shunt converter real power (blue, p.u. ), reactive power (green, p.u.). Fig.6 Current (p.u.) of transmission line L1. In this paper, the control and operation of series and shunt converters with 48-pulse series connected 3-level NPC converter for UPFC application are investigated. A new angle controller for 48-pulse series converter is proposed to control the series injection voltage, and therefore the real and reactive power flow on the compensated line. The practical UPFC real and reactive power operation boundary in a 3-bus system is investigated; this provides a benchmark to set the system P and Q references. The simulation of UPFC connected to the 500-kV grid verifies the proposed controller and the independent real power and reactive power control of UPFC with series connected transformer based 48-pulse converter. N. G. Hingorani, “Power electronics in electric utilities: role of power electronics in future power systems,” Proceedings of the IEEE, vol. 76, pp. 481, 1988. N. G. Hingorani and L. Gyugyi, Understanding FACTS: concepts and technology of flexible AC transmission systems: IEEE Press, 2000. L. Gyugyi, “Dynamic compensation of AC transmission lines by solid-state synchronous voltage sources,” IEEE Transactions on Power Delivery, vol. 9, pp. 904, 1994. C. D. Schauder, L. Gyugyi etc. “Operation of the unified power flow controller (UPFC) under practical constraints,” IEEE Transactions on Power Delivery, vol. 13, pp. 630-639, April 1998. L. Gyugyi. “Unified power-flow control concept for flexible AC transmission systems,” IEE Proceedings – Generation, Transmission and Distribution, vo. 139, pp. 323-331, July 1992. Fig 1.Configuration of the experimental system. Fig. 2. Experimental results verify the effect of PBC in steady-state process. (a) Ch1: reactive current; Ch2: compensating current; Ch3: residual current of grid. (b) Ch1: reactive current; Ch2: compensating current; Ch3: residual current of grid. Fig. 3. Experimental results show the dynamic performance of STATCOM in the dynamic process. Ch1: reactive current; Ch2: compensating current; Ch3: residual current of grid. Fig. 4. Experimental results in the startup process and stopping process. (a) Ch1: reactive current; Ch2: compensating current; Ch3: residual current of grid. (b) Ch1: reactive current; Ch2: compensating current; Ch3: residual current of grid. Fig. 5. Experimental waveforms for testing overall voltage control in the startup process. This paper has analyzed the fundamentals of STATCOM based on multilevel H-bridge converter with star configuration. And then, the actual H-bridge cascaded STATCOM rated at 10 kV 2 MVA is constructed and the novel control methods are also proposed in detail. The proposed methods has the following characteristics. F. Z. Peng, J.-S. Lai, J. W. McKeever, and J. VanCoevering, “A multilevel voltage-source inverter with separate DC sources for static var generation,” IEEE Trans. Ind. Appl., vol. 32, no. 5, pp. 1130–1138, Sep./Oct. 1996.